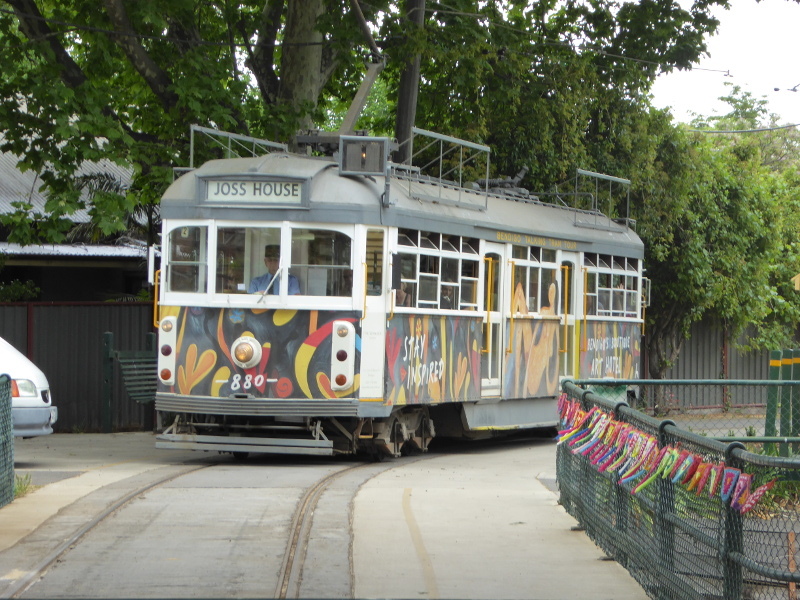 The Bendigo Vintage Tramway made a perfect subject for inclusion in Vintage Victoria, especially with my very broad definition of ‘railways’. We made the trip on the Monday of Melbourne Cup ‘weekend’, so it was quite busy with lots of family groups making the most of the day off, but still ample room for us to get a seat on both the trams we took. 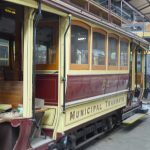 What a great experience, both the ride itself and the tram depot and museum giving me lots of material to make for a fascinating foray into Bendigo’s past. There are several trams that might pick you up on any given day. You’ll see which trams are running on the board standing outside the Deborah Gold Mine information place. 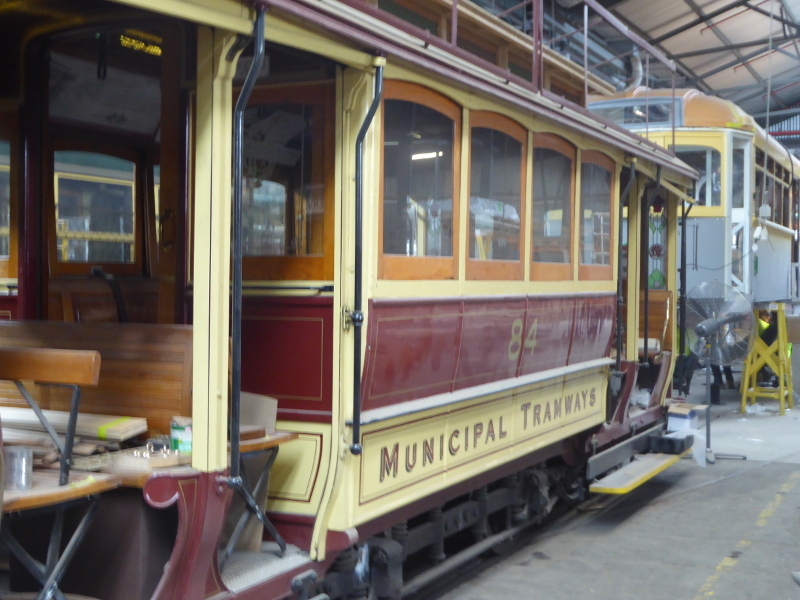 We got lucky with our first tram: a 1914 beauty, made in Adelaide but spent much of its working life running the Prahran and Malvern line before ending up in Bendigo in 1951. 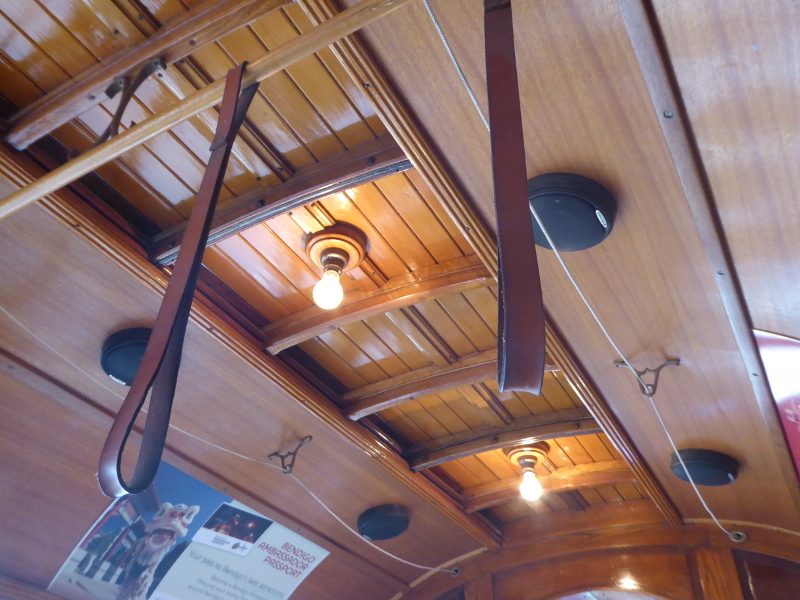 Fantastic wooden interiors, with leather strap hangers to hold onto. And I loved the fresh air blowing through the carriage due to the lack of actual doors in the door space – a single horizontal barrier stopping you from falling out, though you’d want to keep your kids safely away from the space as they’d easily slide under the barrier if they lost their balance or mucked about too much. The open air feel made it a bit noisy at times to hear the historical commentary, though I did enjoy hearing how gold was discovered in Bendigo (by two women, actually, who were just doing the washing in the local creek – their ‘secret’ didn’t last long, though, and within weeks 20,000 people had come to live in Bendigo…). 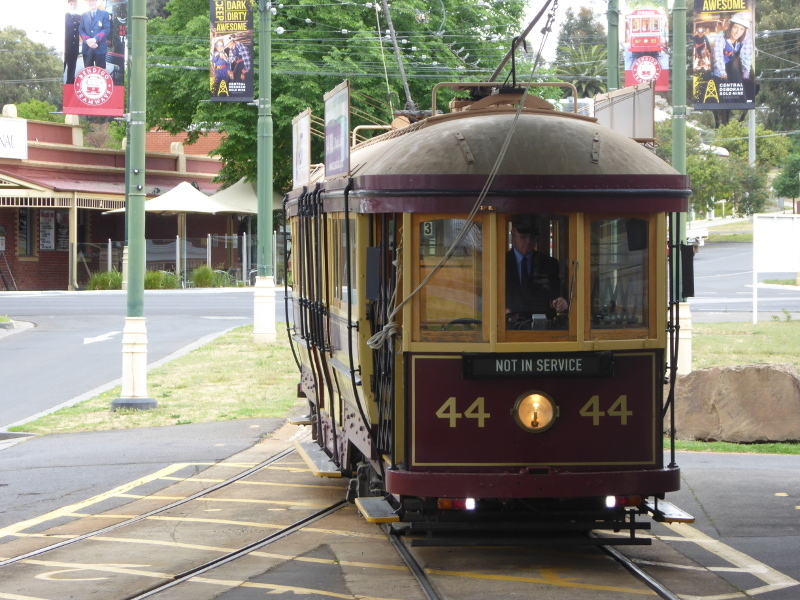 The tram passes through the centre of Bendigo, with its streets that hark back to our London days: Pall Mall, Charing Cross, Chancery Lane (the latter a little alleyway which looked tempting for a future trip). 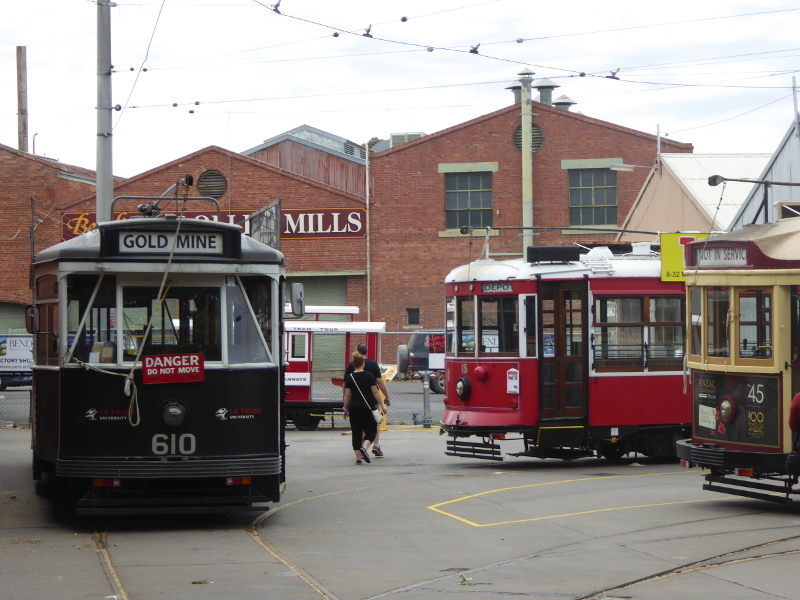 It then goes on a side track to the tram depot and Bendigo Woollen Mills. We hopped off there and let the tram continue its journey without us, as we wanted to check out both the wool and the depot. 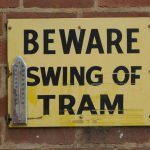 The tram depot was excellent, with some fabulous old tram cars, some dating from as far back as 1908, but above all, it gave me lots of anecdotes to furnish my history section of this blog. I loved the fact that the local community rallied around to save the rolling stock when the public running of trams in Bendigo stopped in 1972 (more on that below under history), and there were some beautiful postcards to help illustrate some of the stories I already had from my Trove searches earlier. Half an hour was about the right amount of time to wait for the next tram out. 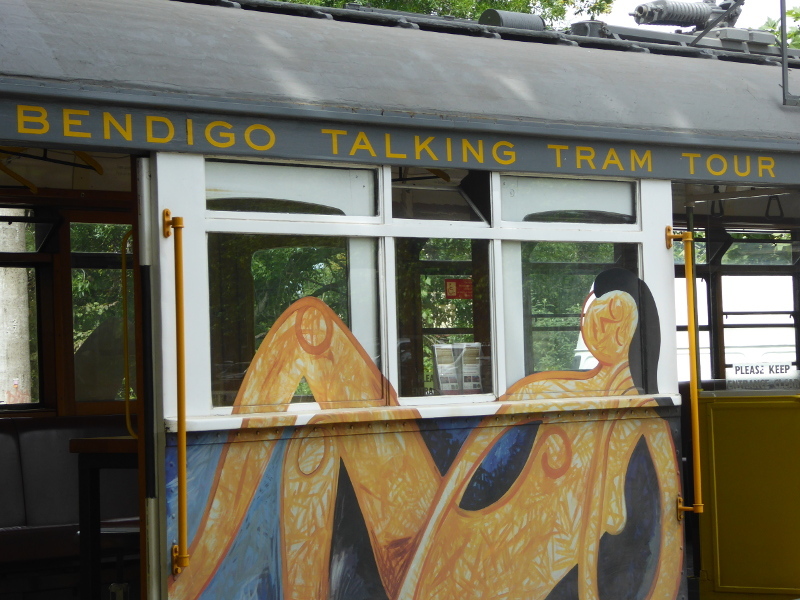 And this was the Dja Dja Wurrung tram, decorated with indigenous artwork. Less of a vintage interior, but still beautiful inside; and the actual closed doors made it much easier to hear the historical commentary. There we learnt about the Joss Temple at the terminus of the tramline. It’s the second oldest Chinese temple in Victoria, and across the road are the Pepper Green Farms, which are old market gardens run by Bendigo’s original Chinese community. There is still an old tram carriage in their gardens, and I hear you can get a cream tea (called Devonshire Tea over here in Australia) some days, so that’s one to return for one day. Last of all we heard the brilliant tale which linked this Vintage Victoria entry with the local cinema in Eaglehawk. Apparently when both the Star Cinema in Eaglehawk and the Lyric in Bendigo were running, they used to share the film reels, which were carefully relayed between the two cinemas by tram. A lovely connection. 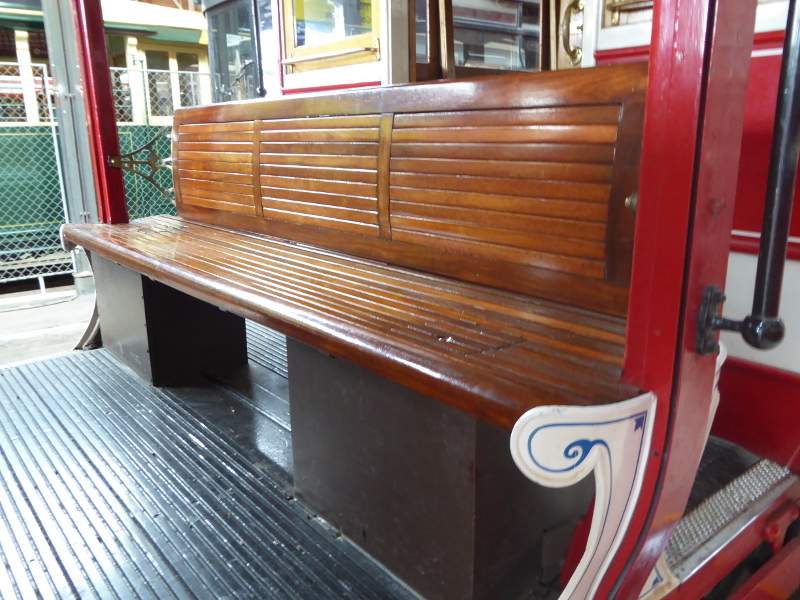 $18 for the basic tram ride and you can get on and off as much as you like. 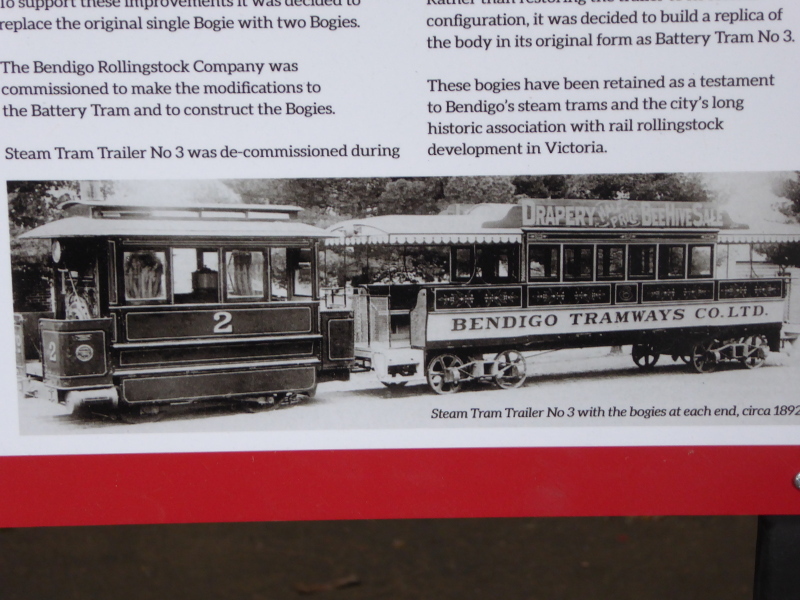 The timetable and details of packages to combine with visit to the gold mine are all on the Bendigo Tramways site. Trams run daily from 10am. Toilets at the Deborah Gold Mine or at the Tram Depot. Other toilets dotted about the Bendigo CBD. 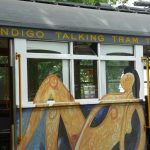 There have been electric trams in Bendigo since 1903, and before that the trams were steam-run, with lots of noise and smoke. The very first trams, though, were battery run. 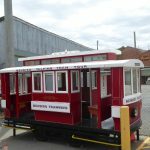 These apparently struggled on some of Bendigo’s hills and passengers would sometimes have to get out and push if the battery ran out on an uphill bit. The first route, by the way, ran from Arnold St to the Fountain. 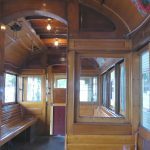 The Bendigo Independent of 9 April 1903 was an early convert, speaking of the comfort for passengers, the handsome design, the splendid fittings, and the novelty of seats that could be turned around when the tram changed direction. 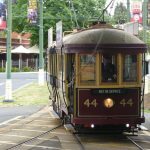 News reports just weeks after the electric trams were introduced in Bendigo spoke of problems caused to the town’s telephone connections, with people living along the tram routes having whizzing noises in their earphones as they tried to make calls. It was apparently so bad in Eaglehawk that many residents asked for their phone to be cut off as it was useless since the electric trams started up. By the 1920s, trams were under a lot of pressure from the arrival of buses in Bendigo. They weren’t helped by one senior barrister from Bendigo who returned from a trip to North America with the claim that Bendigo’s trams were the noisiest on earth…But also the bus drivers were known for leaving the terminus two minutes ahead of a scheduled tram so that they picked up most of the fares. 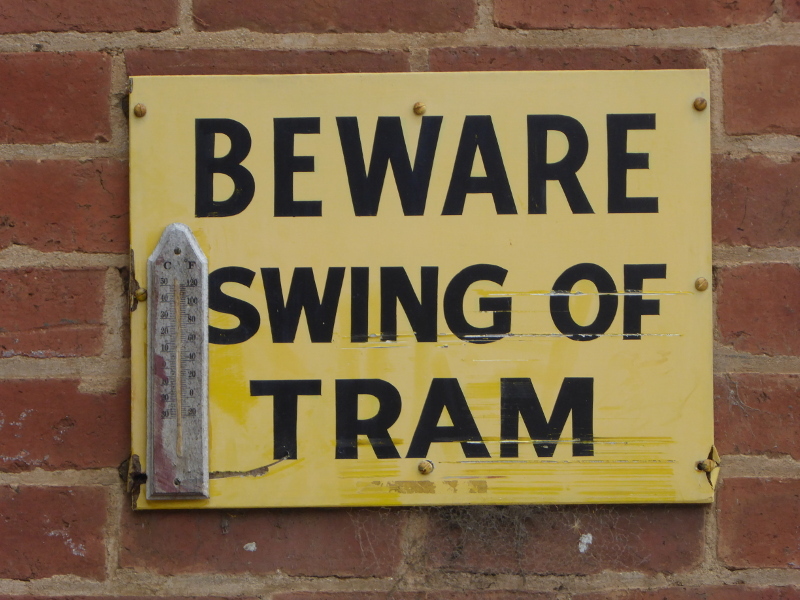 A 1920s lightning bolt caused one tram on its way to Golden Square to jump off the rails. Fortunately nobody was hurt, though the driver made a reflex leap to the ground from his seat. 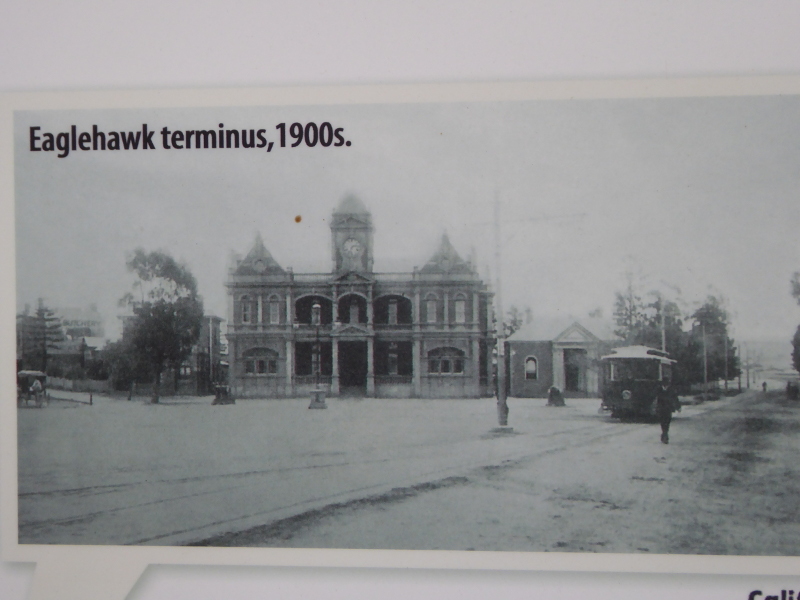 My favourite story from the history of Bendigo trams dates back to 1900 in the steam-driven days when a double car tram got uncoupled on its way to Eaglehawk, and the smaller car ran freely down the hill, with one passenger on board, ending up overturned in front of Eaglehawk Town Hall. The hero of the day was the tram guard, one Conductor T. Leahy, who stopped his fare collection on the other car, leapt to the runaway car and rang an alarm bell to warn people ahead of the runaway vehicle. The final days of the public tram service are also discussed in the Depot Museum. 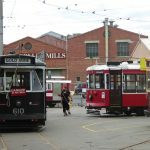 When the tramways were closed in 1972, the deal was that some of the rolling stock would go to Adelaide’s tram museum, but the workers here took action to stop that on Day 1, with John Kelly taking an iron bar to the tram tracks to make them unusable; and Dennis O’Hoy disabling the motors. Bendigo’s Mayor also got involved, issuing a rallying cry to the public, who came out in their thousands to blockade the tracks and stop any rolling stock from being moved away from the city. They won, and the Vintage Tramways were running not long after that. 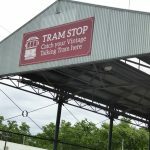 The Tram depot has stories from Tom Griffiths which very much matched the Vintage Victoria approach to history. He worked the trams from 1924 to 1970. It sounded like working conditions were tough at times, according to his tales. Anyone arriving to work in new shoes was liable to face the sack since the bosses thought that wages were not high enough to buy new footwear and so the worker must have been fiddling the fares. 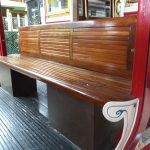 Trams had only 24 seats, but conductors were expected to take anything upto 80 passengers at a time, and also faced dismissal if they left passengers behind. Tram drivers stood all day long, with only 20 minutes break through a long shift. 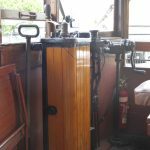 And of course the tram crew often had to get out and fix things, whether shifting a loose wire back onto the overhead cable (no easy task) or basic mechanical work, or simply getting out and helping to push. 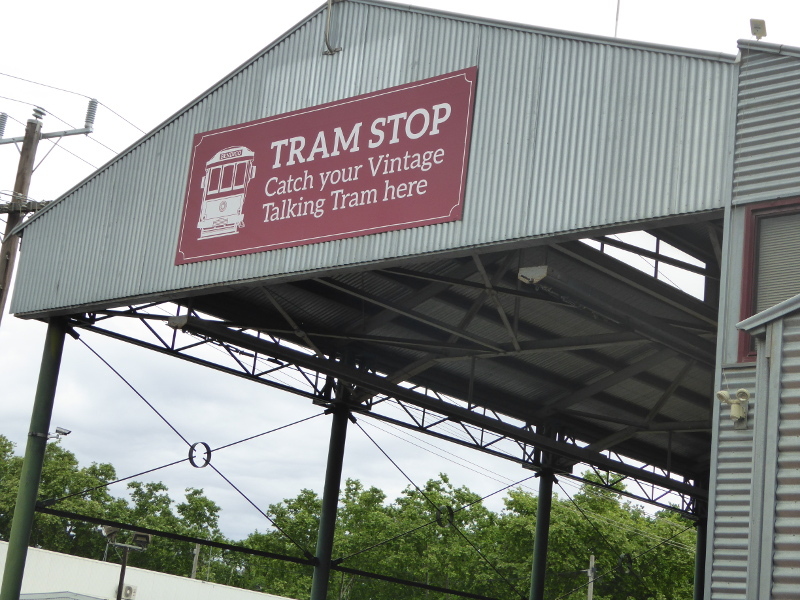 What are your memories of Bendigo trams or of the Vintage Tramways tourist route? 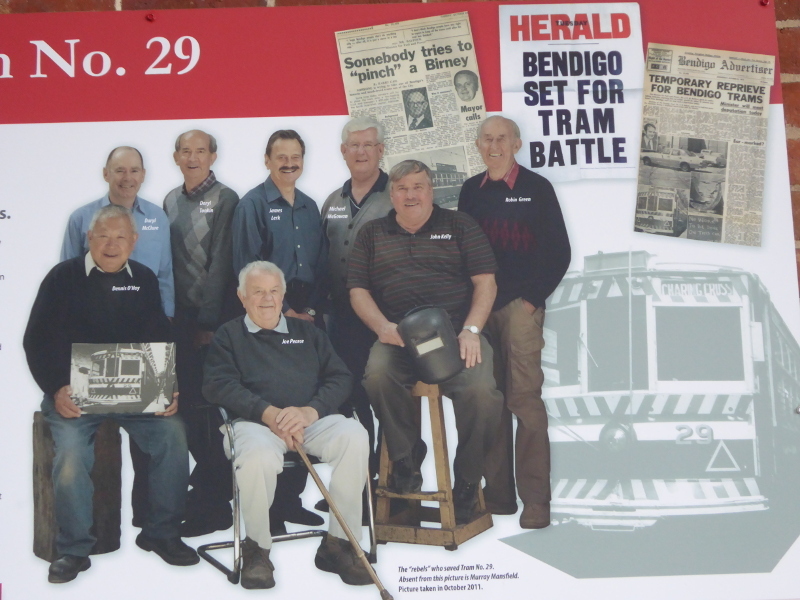 Did you ever travel on Bendigo trams when regular passenger services were still operating before 1972? Or any of your relatives speak of the days when trams still ran here? 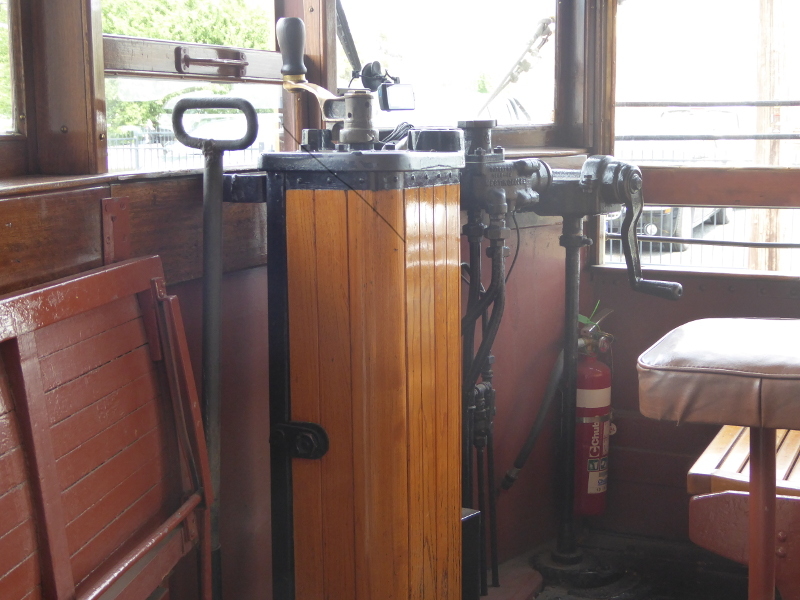 Have you been on the Bendigo Vintage Tramway and got a good story to tell? 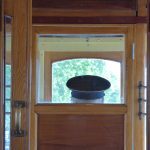 The Nomadic Explorers took a nice set of pictures along the tram route for their blog post on the Bendigo Tramways in 2013. 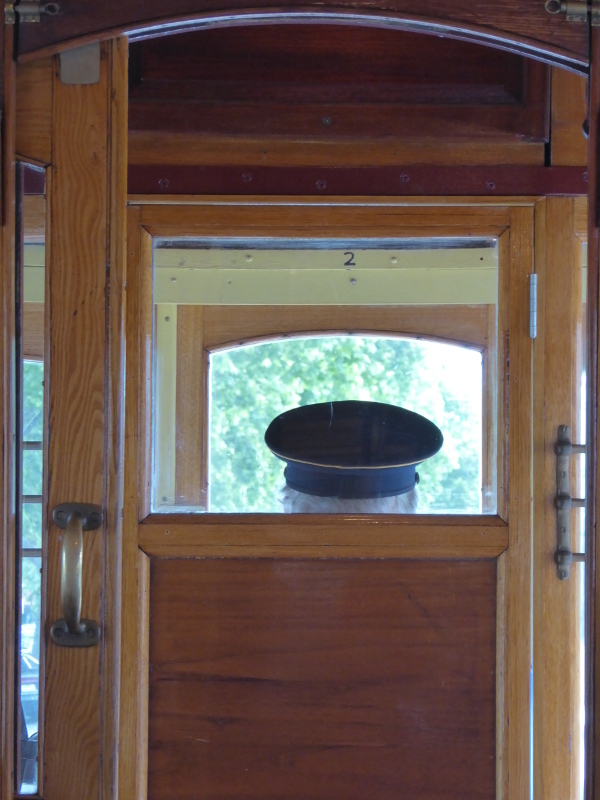 Shayne Wright’s arty photography blog is very interesting on the Bendigo trams. 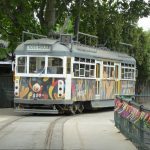 Deb’s travel and style blog got the century wrong for the start of the trams, but has some great photos so worth a look. 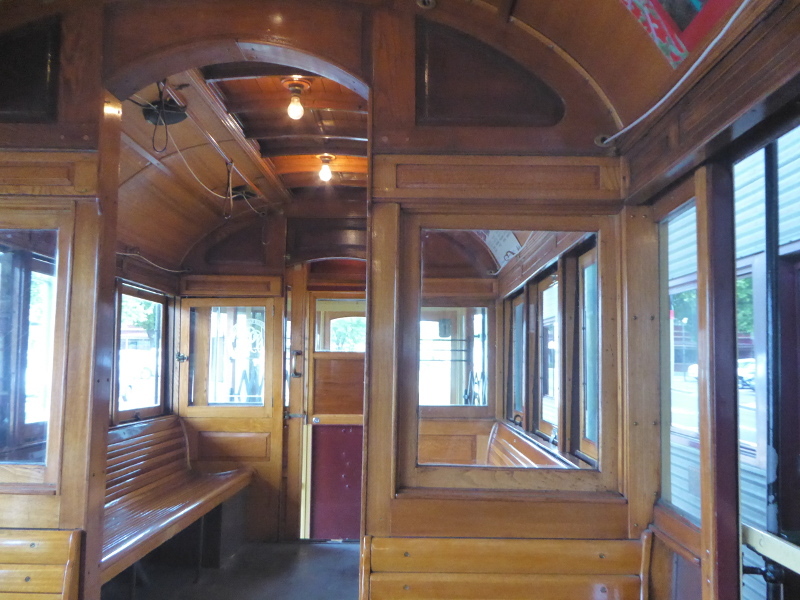 Peter & Vicki’s travel blog has some lovely photos of tram interiors. 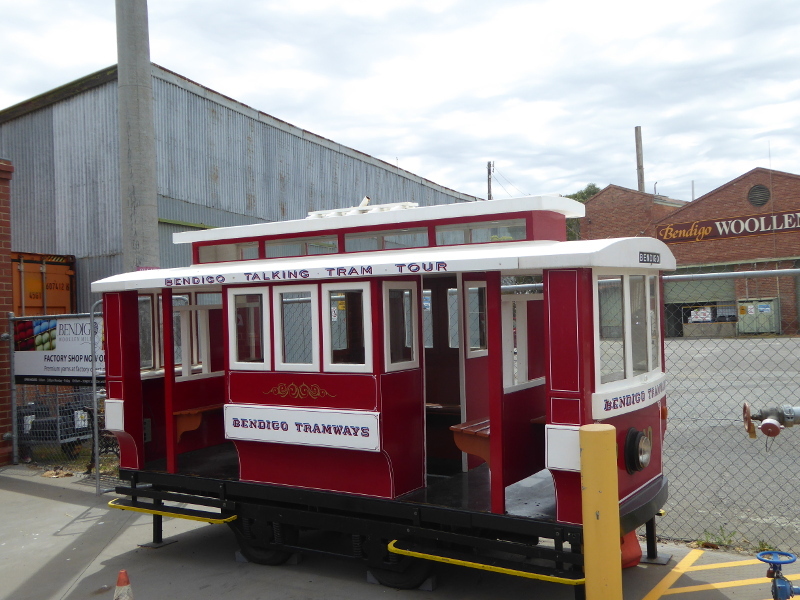 And Chuffed.org hosted Bendigo Trams’ crowdfunding efforts to restore another old tram. 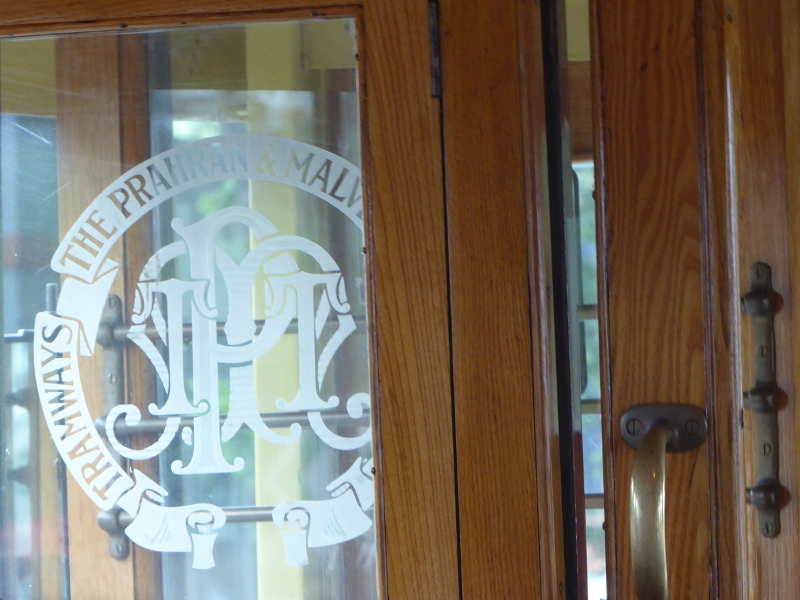 I really like the little coffee shop near where the tram turns off to head to the Woollen Mills. It’s a kind of hole-in-the-wall called Hustle Coffee and serves up a great cuppa. Or get off at the stop in the CBD and try El Gordo in Chancery Lane – really good coffee there, too.